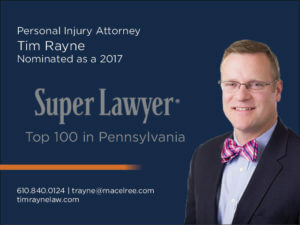 MacElree Harvey is proud to announce that Personal Injury Lawyer Tim Rayne was named to the 2017 Top 100 in Pennsylvania and Top 100 in Philadelphia Lists by Super Lawyers in the Plaintiff Personal Injury practice area. 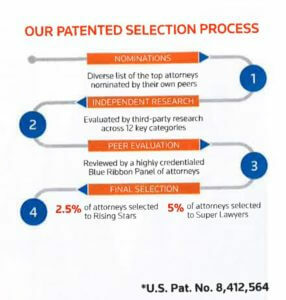 Super Lawyers uses a patented selection process to ensure that it is a credible and impartial attorney rating system. The four-step selection process has been deemed a comprehensive, good-faith and detailed attempt to produce a list of lawyers who have attained high peer recognition, meet ethical standards and demonstrate achievement in their field. Tim has been named to the Top 100 Lists in 2012, 2014, 2015, 2016 and 2017. Tim helps injured accident victims receive fair treatment from insurance companies. 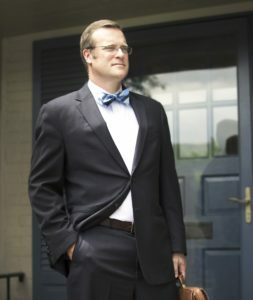 Tim handles a diverse collection of injury cases from car, motorcycle and truck accident cases to slip and fall and medical malpractice cases. Tim meets with clients in both the West Chester and Kennett Square, Pennsylvania. Contact Tim at [email protected] or 6108400124.